Source: Yale University Vizualization on Climate Change . Select maps by title, in the “Select Question” drop down menu. There is virtually no carbon dioxide output, and waste water can be recycled and shut-downs can be safe (passive). Properly stored (sequestered geologically) radioactive waste is contained and harmless to the planet; this technology has been proven over decades. The link above opens a new page about the state-of-the-art in nuclear fission power plants, and how they are the best, most powerful bridge we have toward the clean, renewable energies of the future, like nuclear fusion. Concrete and Steel production is a significant contributor to greenhouse gases (GHGs). Concrete in highways and buildings, and steel in buildings and vehicles are used in huge volumes. 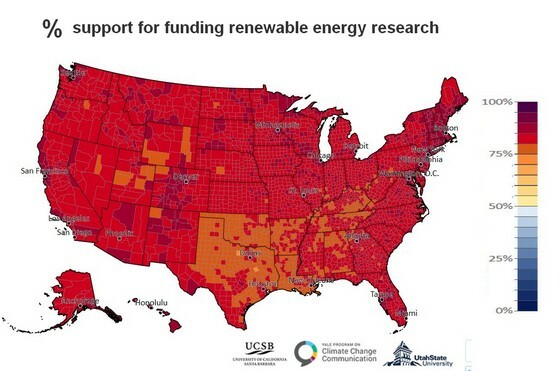 When comparing the climate impacts of renewable energy, usage of concrete and steel is relevant. Nuclear has the least secondary impact on GHGs, and wind power has the most. Massive investments in nuclear fusion have been made by governments since the 1960s. Billions of dollars. Fusion offers limitless clean renewable power. A simple and cheap element, like hydrogen, can be fused (combined) at super high heat with another particle to create a new atomic particle, which is lighter. The loss in total mass is coverted directly into energy. This is the process that powers the sun and an H-bomb explosion. Fusion has the power of an H-bomb, without harmful radioactive output. In an H-bomb, a radioactive A-bomb is used to trigger the super high heat. In fusion the super heat is controlled by massive magnets and cooling systems. Unlike atomic nuclear fission reactors of the present, nuclear fusion reactors will be clean renewable sources of energy. The current state of the art in particle fusion, via hot plasma containment, is 5 milliseconds. More than a half second is the target for commercialization. This is predicted to be achievable in the current century. A 10 / 20 – fold increase in contaniment is sought by 2020.
at some time, decades into the future. Unfortunately, commerialization of fusion is not guaranteed, even though optimism is high. Commercialization means producing more power than is consumed to reach plasma containment. It may take several more decades to achieve. It will then take more time to build-out mega-plants to supply the world with fusion power. Meanwhile, climate change marches on, and cannot wait to be addressed. 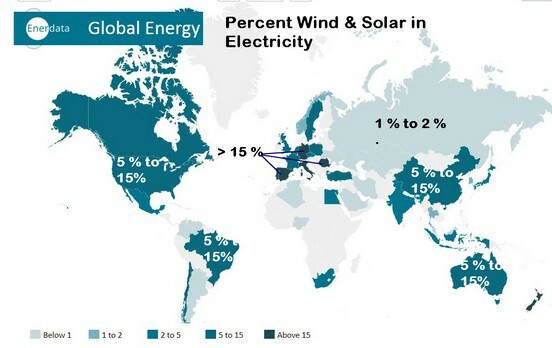 generating electricity in the world today. Enerdata source link below. Deloitte Insights article: Global renewable energy trends – Solar and wind move from mainstream to preferred, by Marlene Motyka, Andrew Slaughter, and Carolyn Amon, Oct 2018. The article outlines how solar and wind power, including storage, are becoming cost competitive with fossil fuel power generation. It is an optimistic view and seems to include some assumptions on US subsidies and the benefits of storage for balancing peak power demands. An in depth view on solar and wind costs is available in a PDF document by research firm Lazard. Title – Lazard’s Levelized Cost of Energy Analysis — Version 11. (Click the link to download the PDF.) It is a data source for the Deloitte article. The WEF has released a report saying that the investment in renewable energy was double that of investment in seeking new fossil fuel sources in 2017. That is definitely a good statistic. But it does not negate the fact that tremendous existing coal reserves will continue to provide cheap fossil fuel for many years in an energy hungry world. Coal reserves in 2006: _________________ 909,064 million tons. Given that the Earth has coal to burn, why not turn to “Clean” Coal? The cost of a clean burning plant is still very high – higher than solar or wind power. Then, there is still some CO2 to handle. Carbon dioxide is actually heavier than carbon. Burn a ton of coal and get three tons of CO2. Ooops. WHAT DO YOU DO WITH ALL THAT CO2? And once the compressed CO2 is underground, what will stop it from leaking through to the suface and back into the eco-sphere? It may be possible to trap water-infused CO2 in basalt rock, but this is unproven in volume and is expensive. DANGER – Politicians may use the fairy-tale of “clean” coal, to avoid dealing with the removal of coal-based energy. Without a new constraint on use of coal, oil & gas, climate change will continue to disrupt the world we know today. Existing financial drivers and good will are not enough. To see the section on Fusion 101. Too bad the US is largely in complete denial about human caused climate change. Brain washing by Big Oil has many people denying well established science. Remeber when smoking was good for you? These maps reflect a 2018 view. Maybe a year of wild fires, droughts and floods will change people’s minds. 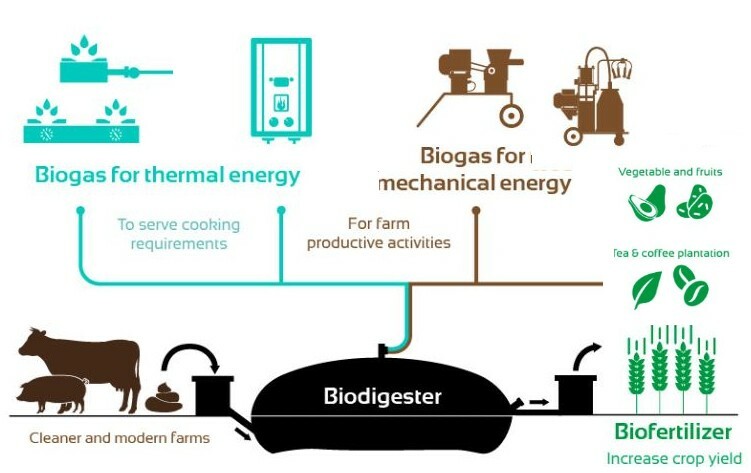 Biodigesters, which ferment animal waste. Farming equipment, with mechanical energy output. Production of Biofertilizer for crops (vs chemical). Amazing results by Systema Bio in India, Kenya, Central America. Concrete reductions in methane, CO2, and waste products. Creation of alternate fuels and fertilizers. There are also other product and service initiatives for converting cow patties into more effcient, less polluting fuels for cooking. They reduce particulates and methane output. This is very promising technology. The hydrogen is then available as a renewable fuel. Bulk commercialization may be possible. Best, the energy yield is higher than in natural plant photosynthesis.